3 Bedroom Terraced House For Sale in Totnes for £340,000. This delightful three bedroom modern style home is in a great position overlooking Totnes with some spectacular far reaching views and has the convenience of an easily manageable garden and a bus stop just over the road. The property has a lovely country style fitted kitchen to the front and an open plan lounge/diner leading off to the pretty rear garden. The first floor has three well proportioned bedrooms, a refitted shower room and additional bathroom with 'spa' bath. This property also has the benefit of a garage and resident parking. A great front runner which should be top of your viewings list !! Double glazed window to front aspect, radiators, large storage cupboard, staircase to first floor, hardwood flooring, dado rails. Low level WC, hand basin with tiled splashback, radiator, extractor fan. Double glazed window to rear aspect with lovely far reaching views, feature fire surround with marble hearth and insert, fitted gas fire, coved ceiling, hardwood flooring, radiator, double glazed sliding patio doors. Radiator, hardwood flooring, coved ceiling. Double glazed window to front aspect, range of fitted range of wall and base units, work tops, part tiled walls, stainless steel single sink unit and single drainer, gas cooker point and chimney style extractor hood over, coved ceiling, tiled floor, large pantry cupboard, space for fridge/freezer, plumbed for washing machine and dishwasher. Airing cupboard, loft access, coved ceiling. Double glazed windows to rear aspect with far reaching views, range of built-in wardrobes, coved ceiling, laminated wood flooring, radiator, TV and phone points. Fully enclosed shower enclosure with glass screen, low leval WC, hand basin with tiled splashbach, extractor fan, heated towell rail, coved ceiling, tiled floor. Double glazed windows to front aspect, radiator, wood flooring, coved ceiling, TV and phone points. Double glazed windows to front aspect, radiator, wood flooring, coved ceiling. 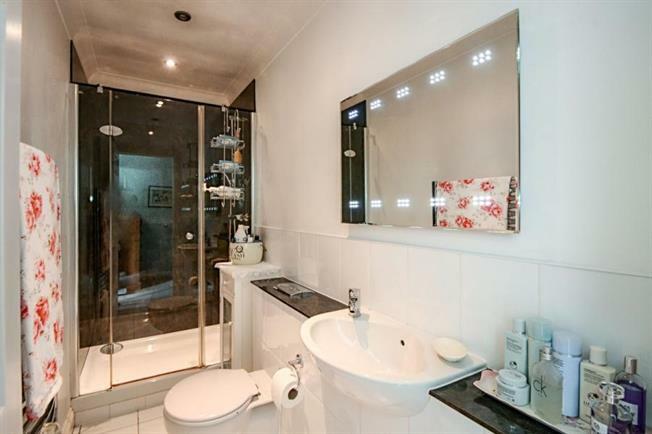 Corner 'Spa' bath, low level WC, circular hand basin with built-in glass shelf, heated towell rail, part tiled wall, tiled floor, coved ceiling, extractor fan. Sun patio, lawned area, shrub borders, outside light, trellised fencing. Up and over door, power points, light.